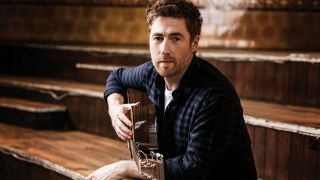 Jamie Lawson: "Ed Sheeran’s been a fantastic boss"
Jamie Lawson has been making serious waves in the world of acoustic pop. On the cusp of releasing his new record, the Sheeran-endorsed singer-songwriter talks love, Lowdens, and how it all started. “This record is really about the opposite ends of love,” admits the singer-songwriter on discussion of his new record. “On the one hand you have the light flirtatious side; the butterflies and the nerves of when you first meet someone and fall in love. On the other hand, after spending your whole lives together, you reach the deep end; the passing away and the loss of love and the sadness of it. “Those seem to be the two main themes of this record. I’m not overly sure why it came out this way, but whenever I’m writing I try not to question it, I try and let what’s inside me get out, and that seems to be what came out. His new record, Happy Accidents, is Lawson’s second album to be released on Ed Sheeran’s label, Gingerbread Man Records. His first album on the label peaked at Number 1 on the UK album charts in 2015 after his hit single Wasn’t Expecting That received huge critical acclaim. However, Lawson had, in fact, released two studio albums in Ireland in 2011 - Last Night Stars and The Pull of the Moon - before the release of Wasn't Expecting That, but his success did not go beyond Ireland. Lawson's popularity abroad began when he was signed to Gingerbread. Lawson was the first artist to sign-up back in 2013 after touring alongside Sheeran. “Ed’s been a fantastic boss,” Lawson explains. “He seems to really like what I do, which helps! Like last time he hasn’t interfered at all with the writing process, he just lets me get on and do what I do. He did offer up some instrumentation advice on certain songs which worked out well; some added early keys on A Little Mercy and backing vocals on Sing To The River probably wouldn’t have been there if he’d not suggested them, so he does get stuck in. It doesn’t take long before the discussion turns to gear. “I own a Taylor 410CE and I’ve had that the longest. It's been a very good and trustworthy gigging guitar; you had to be a very poor sound engineer to make it sound bad, which occasionally, when you’re playing the circuit you do come across. But on the whole it’s been great. “These days I’m more likely to play my Martin OM-21 than the Taylor. I’d been playing the Taylor for so long that I fancied something different. The Martin I have is a little less shiny and bright and so melds in well when I’m playing with the band. I don’t want the band to be led by the acoustic just because I’m playing it - it should sit in there with the rest of the instruments as it does on the record and the Martin does a good job of that. “I also have a beautiful Lowden S-35C; that sounds so sweet you never want to add anything else to it and I’ve recently bought a Gibson Hummingbird, which I got in New York, and I’ve been playing that a fair bit. It has a very even tone to it, very balanced sound and seems to be one of those late night acoustics that you can play long into the early hours of the next morning. Lawson talks us through his current setup for his live set and home. “We’re just about to head back out on the road now with James Blunt in October and November. I’m doing both solo shows in Europe and band shows in the UK but generally I’ll be playing either the Martin or the Gibson. Lawson cites his biggest influence as Van Morrison, along with a few other reputable names. At the age of eight Lawson was given a guitar for Christmas - but claims to have no idea why he asked for it. The Washburn guitar that Jamie received at Christmas sufficed and served its purpose until some wise words off a fellow musician persuaded him to upgrade to a newer, better sounding model. Jamie Lawson’s new album Happy Accidents is out now. 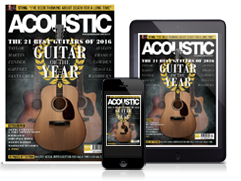 We're the UK's only print publication devoted to acoustic guitar.